The men who served so bravely in Bomber Command came not only from Britain but from all over the free world. Their unswerving courage, devotion to duty and the extraordinary contribution they made between 1939 and 1945 was beyond measure, without RAF Bomber Command there would have been no final victory in Europe. sacrifice - a casualty rate only surpassed by those who served in the Kriegsmarine’s U-boats. The aircraft that many of these airmen flew from 1942 onwards was the legendary Avro Lancaster, known as the backbone of Bomber Command. It was probably the greatest heavy bomber of World War II and Sir Arthur Harris, Commander in Chief of RAF Bomber Command, believed that the Lancaster, powered by its four mighty Merlin engines, was ‘the greatest single factor in winning the war’. “Without your genius and efforts” he wrote of the Lancaster crews, “we could not have prevailed”. 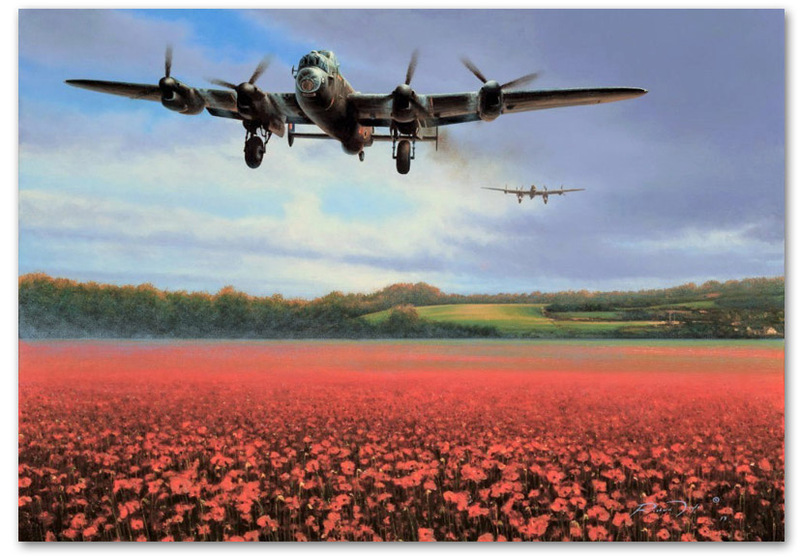 It is therefore fitting that Richard Taylor chose the Lancaster in his moving limited edition, to represent all those who served with Bomber Command during World War II. Depicted are the aircraft of 106 Squadron whose motto Pro Libertate - ‘For Freedom’ - not only gives title to the painting, but perhaps symbolises the driving force behind so many of these brave young men who faced such daunting odds. An example of a single remarque by Richard Taylor, with his signature colour accents. Double remarques can be two separate drawings but are more typically a single, larger and more detailed work as shown here.